We exist to help you experience, explore, and connect with nature through exciting outdoor adventures. It's why we built a 7-line zipline tour in beautiful Brainerd, MN. Our Earth Day Sale is all about helping you fit an outdoor adventure into your busy spring and summer schedule. 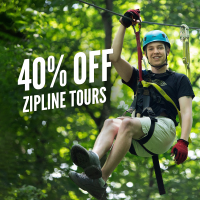 Purchase your tour by April 22nd and you'll save 40%. Good for any midweek (Monday – Thursday) tour between May 1st and September 30th*.